Sophomore guard Emily White competes in the Whittell Invitational. The Incline girls begin Northern Division III play with home games against West Wendover on Friday at 6 p.m. and Battle Mountain Saturday at 2 p.m.
Incline’s girls tuned up for league play with a 2-1 showing at the Whittell Invitational last week. The Highlanders opened the tournament with a 49-24 win over host Whittell on Wednesday. They went on to lose to Fall River (McArthur, Calif.), 41-37, on Friday before earning a 35-17 win over Lone Pine on Saturday. Against Lone Pine, freshman Taylor Redfern led the Highlanders with a game-high 15 points to go along with her five assists and four steals. Madison Wallner added five points and four steals, and Harmony Bates and Kira Porter each scored four points. Porter pulled down 13 rebounds. Incline limited Lone Pine to four points in each of the first three quarters and five in the fourth. Only three players scored for the Golden Eagles, led by Jessianne Joiner’s nine points. The Highlanders fell behind Fall River (5-1) early and could not make up the deficit despite a strong second half. The Bulldogs led 15-7 after one quarter and 27-15 at the half. 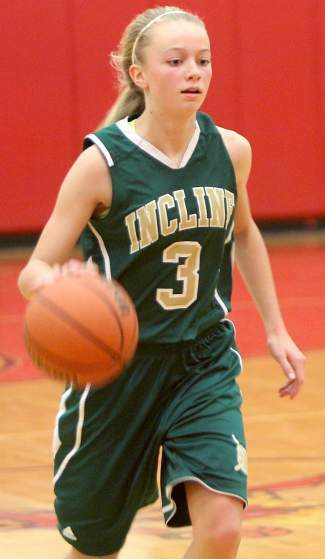 Incline outscored Fall River 12-9 in the third quarter and 10-5 in the fourth, but it wasn’t enough. Porter led the way with 11 points, 13 rebounds and 10 blocks, while Wallner scored seven points, Emily White had six, and Christine Schwartz and Redfern had five apiece. Porter opened the tournament with a big game against Whittell. She scored 22 points, grabbed 14 rebounds and blocked six shots. Wallner contributed eight points, White scored five points and had five steals, and Redfern had five assists and three blocks. The game was a rout from the start, with Incline leading 12-3 after the first quarter and 27-7 by the half. The Highlanders are now 5-3 on the season.